Warner Bros. and DC Films had a major presence at last weekend's San Diego Comic-Con, but there was no mention of the Batgirl movie, Birds of Prey, or even the Joker Origin Movie, which just received the green light. Since there wasn't anything new reported about the standalone Barbara Gordon movie, a new rumor has popped up in regard to who could possibly star in the film. As it turns out, Warner Bros. might be looking into Kristen Stewart or an actress similar to her for the role. It was recently reported that Barbara Gordon will not show up in Birds of Prey, which has yet to be proven. If Batgirl shows up in that movie, it will reportedly be a different iteration. However, Warner Bros. and DC Films are still moving forward with the standalone Batgirl movie, which will feature Barbara Gordon and according to a new rumor, the studio is eyeing a "Kristen Stewart prototype" for the role. The whole report reads. "At WB they described the kind of actress they want for Barbara Gordon as Kristen Stewart prototype so I guess they really want her to play Babs... (In her solo movie, cuz she's not in Birds of Prey AT ALL)." This is not an official report by any means, but it is certainly intriguing. 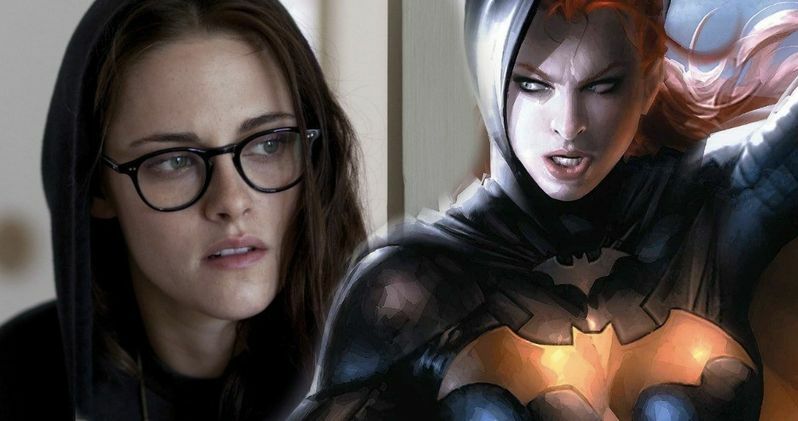 Kristen Stewart could make for a pretty interesting version of Barbara Gordon and Batgirl. In addition to the possibility of Stewart taking on the role, the report also doubles down on the Birds of Prey rumors that Barbara Gordon will not show up in that project at all. It was recently revealed that Christina Hodson, who wrote the Bumblebee movie, was brought on board to write the screenplay for the Batgirl movie after Joss Whedon exited the project. However, that was the last bit of official news that we have heard about the Barbara Gordon standalone film. Other than that, it has all been reports from "inside sources," which are sometimes accurate, but more often than not, they're false. Kristen Stewart in the starring role could be a gamble for the studio. Related: Batgirl Movie Goes Searching for a Female Director? Again, there has not been any official confirmation of any casting news for the Batgirl movie, which is still in the very early stages of development. Many people were skeptical that Joaquin Phoenix was in talks to take on the role of the Clown Prince of Crime in the Joker Origin Movie, but look how that all worked out. That went from rumor to official casting in a matter of months. With that being said, Kristen Stewart, or an actress like her, could actually be what Warner Bros. and DC Films are after. We're just going to have to wait and see how this all pans out. You can read more about the possibility of Kristen Stewart taking on the Batgirl role below, thanks to Daniel RPK's Twitter account. At WB they described the kind of actress they want for Barbara Gordon as "Kristen Stewart prototype" so I guess they really want her to play Babs... (In her solo movie, cuz she's not in Birds of Prey AT ALL). Should Lena Dunham Direct Batgirl?